Last year I was awarded an Individual Artist Grant from the Indiana Arts Commission. 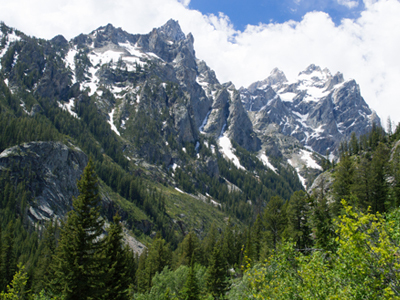 I had applied for funding to help cover the costs for a research and fieldwork trip to the Grand Teton National Park. I wanted to be able to explore and study that landscape, paint and draw on site, and take reference photography that I would be able to use in future studio paintings. As part of the project I also wanted to chronicle the trip so that it may aid any other artists who to take on a similar expedition. My first entrance into the park by plane could not have been more visually dramatic. We arrived at exactly the right time to see an intensely and solely red sunset silhouetting the enormous mountains as we flew by. I wish I could describe it with words, but that’s why I’m a painter. It was very late when I found out my checked baggage was delayed, and thankfully a nice gentlemen named Kevin from Snake River Taxi had come into the airport to see if anyone needed a ride to Jackson, where I had a hotel reservation. The next morning was spent securing my rental car and waiting for my baggage to arrive. 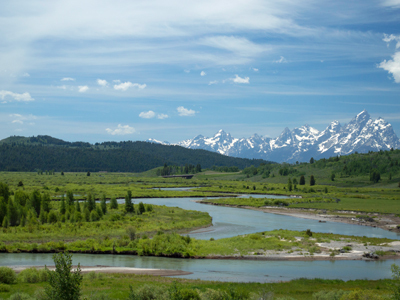 As I drove north on 89 towards the airport, I crested a hill just after a strategically placed sign welcoming me to Grand Teton National Park, and was overwhelmed with the site of the mountains, which I had not seen in 24 years. I spent most of the day driving around, taking pictures, and getting familiar with the area. I had lunch at Pearl Street Market, which I would do many times over the trip. I recommend the Teton Club. I would also recommend Nikai Sushi Bar. That afternoon I went to a bear safety demo at one of the visitors centers to make sure I knew how to properly fire a canister of bear spray. Anyone hiking in bear country should have bear spray, and I highly recommend you read the book Bear Aware by Bill Schneider. It is of course important to familiarize yourself with the local wildlife that my present a hazard to you or to which you may present a hazard. 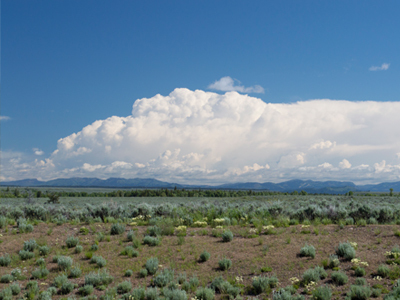 I spent some time at the Craig Thomas Discovery & Visitors Center, where I learned about the different types of environments in the area (wetlands, sagebrush, meadows, forests, and alpine) as well as the types of rocks that make up this very young mountain range (gneiss, granite, diabase, sandstone, limestone, and quartzite). Also at the visitors center I got to see some really great landscape paintings, including works by Stephen C. Datz, Dave Santillanes, Conrad Schwiering, and Jim Wilcox. The next day I went on a ranger-led hike to Taggart Lake. We had to test our balance across a couple logs because some bits of the trail were flooding due to earlier-than-normal peak snow melt. I learned that I really do have cat-like balance, but I was also glad that I sprung for waterproof hiking shoes (these worked well for me) because I did have to cross some streams throughout the trip. I should mention here the importance of giving yourself time to acclimatize to a higher altitude. I picked shorter, lower elevation hikes in the beginning and planned to work my way up to longer, higher elevation hikes later on. In the afternoon I painted at the Albright View Turnout (named after Horace Albright, second director of the National Park Service - for more information on the history of the National Parks, I highly recommend Ken Burns’ documentary). The next morning I found out that the ranger-led hike to Jenny Lake that I was planning on joining was full, so I took a scenic drive up the Teton Park Road. I took photos at the Jenny Lake Overlook, Cascade Canyon Turnout, Jenny Lake Lodge, Cathedral Group Turnout, Mountain View Turnout, Mount Moran Turnout, and the Potholes Turnout. After all this I was incredibly tired and realized I was still getting accustomed to the higher elevation. So I went back to the hotel to rest and then went out later to do some more painting at the Teton Glacier Turnout. I should also say that if you’re on a trip like this, you should have some things planned out, but also have some things on the sidelines that you can insert into your itinerary when necessary. I was still feeling sluggish after painting so I decided to spend some time checking out some of Jim Wilcox’s paintings at his gallery. It was really great to be able to see a lot of his original pieces in person and up close. Next on the list, I was finally able to go on the ranger-led hike to Hidden Falls near Jenny Lake. The ranger, Josh, was a graduate student in geology and so we learned a lot about the formation of the Tetons. It was very enlightening. We learned about the older and harder rocks, gneiss (2.7 billion years old) and granite (2.5 billion years old) and that they are a large part of why the Tetons are as tall and dramatic as they are, aside from the fact that the range is also younger and has had less time to be worn down than something like the Appalachian range. I spent some time at the falls and then split off to hike back around the high pass of the southwest trail around the lake, and of course took many pictures along the way. When I got back to the trailhead there was a crowd of people around an elk who was having a snack. I also smelled some kind of shrub that smelled like honey. I’d like to find out what that was. I finally was able to wake myself up very early the next day in order to get some photos of the sunrise, and saw 4 young elk chasing each other around just outside of town. 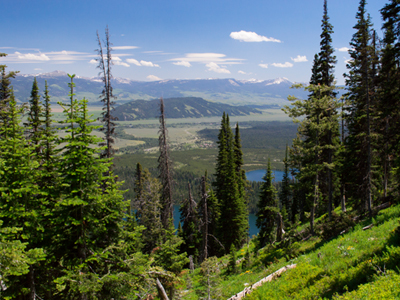 Later in the day I drove up to Snake River Overlook, the view made famous by Ansel Adams, to do some painting. It was quite unnerving at first because there were several onlookers who chose to stare uncomfortably close as opposed to saying hello. I did get to talk to some nice people there though. I talked shop with a plein air painter named David Zenger. 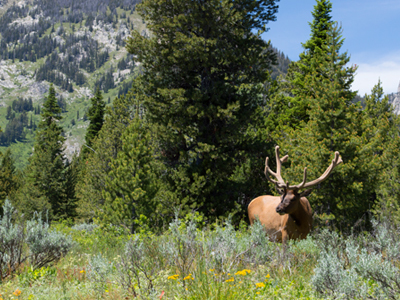 I also talked with an older couple from Chicago who had been visiting the Tetons since 1966. The painting turned out alright, though it felt a bit cartoony, a little plastic. Even though I was using Golden’s open acrylics, in this environment of low humidity, plus the strong winds that day, my mixed colors could tend to dry out if I wasn’t mixing large enough amounts. This was difficult since I was using such a small pochade box; there wasn’t a lot of room on the palette. Due to this I tended to be more successful when mixing colors on the fly with a brush as opposed to mixing large amounts of color with a knife. I also found more success working on smaller pieces due to these constraints. I also noticed that I’m not huge fan of the slight sheen that you can end up with from the open acrylics, as opposed to the more matte finish I'm used to from my usual Liquitex paints. Of course, this is a preference coming from an acrylic painter, not an oil painter. The elevation, in addition to the heat, again seemed to take a lot of energy out of me, though all I was doing was standing and painting. I did get a lot of really great pictures of some storm clouds rolling in over the mountains, including a really great shot of a mirror image cloud hanging over Blacktail Butte which will make for a great start for an abstract piece. I also saw a mountain bluebird hovering perfectly still in mid-air; apparently its force of flight matched the force from the wind exactly. In the morning I decided to go across Jenny Lake and hike up to Inspiration Point. On the hike up I saw my first moose in the wild. I didn’t attempt to get close because moose can be very ornery and at least as dangerous as bears. But I did get a picture. This was my first hike where there was a significant increase in elevation. I had to rest a few times and drink plenty of water. Even if you are in very good shape, adjusting to the lack of oxygen at higher altitudes can be difficult. My advice is to be as fit as you reasonably can before your trip if you want to have as many options as possible for exploration. After I started to become more comfortable with the altitude later on in the trip I felt like I'd be a Kryptonian on Earth when I got back home. And apparently some athletes make use of this benefit when training. When I did get back to my normal altitude I shaved over a minute off of my mile run time. So needless to say I was feeling pretty spry by the end. I hiked back a bit to get back to the junction that would lead down Cascade Canyon. I didn’t get as far on this trail as I would have liked on my first attempt, as the beginning of the hike also has the steepest grade. (I’d also recommend National Geographic’s series on hikes, as they have very good info, maps, and elevation charts so you know what you’re getting into.) Cascade Canyon was the most beautiful place that I’d ever set foot in, with towering mountains on either side, snow melts and meadows, pine trees, boulders, and the Cascade Creek flowing down the canyon floor. That hike alone made the trip worth it. It was just the type of landscape that I’ve always wanted to incorporate into my paintings. That afternoon I went back to the hotel and had some lunch and was looking through a couple plein air magazines that I’d brought with me. I stumbled upon this quote from Rick J. Delanty, “One bold stroke of paint is better than 10 tentative ones because the boldness reveals the truth and honesty of an artist’s response to nature.” This resonated with me at the time since I was feeling unsatisfied by the painting I’d done at Snake River. Now you could apply this quote to any subject of a painting of course, not just nature. But the key is, and it has been my belief for quite a while, that the absolute most important factor in any art is honesty. So the next time I went out to paint, at the Blacktail Butte, instead of worrying about making an accurate painting, I just worried about making a good painting that I enjoyed creating and seeing. The next couple paintings turned out much, much better. I also realized that the sort of economy of mark that can make a painting look really fresh does not necessarily come from speed, but just from efficiency. Something that is efficient in mark can look very fresh and speedy and confident but can be done quite calmly. The next couple days were occupied by another trip further down Cascade Canyon, a scenic drive up 89 to Yellowstone, and some photos out in the wetlands northeast of the Teton range. Along the way I finally saw some bison in the wild, which was very cool. Yellowstone was great, but it wasn’t the type of landscape that I went out there for, and many of its more unique features were things I’ve seen before and were also unique enough that I would likely not make use of them in my paintings. I should take this time to make a couple notes about some of the equipment I was using. I was taking photos with a Nikon D3200, a pretty standard DSLR, which did the trick for me rather well. Something that I found indispensable however, was my circular polarizer filter. I had bought this awhile ago in order to reduce glare when photographing my paintings, but it's also extremely useful for landscape photography as well. You can reduce glare from water if you want to get more of the natural color, or if you want to be able to see under the water better. You can get more specific color details from the mountains so that you’re not just getting the blue from the atmospheric perspective (so in this case I found myself rotating the filter back and forth to get multiple variations to work from later). One of the absolute best uses of this for me was that you can reduce the reflections from the leaves of plants and trees, thereby getting much richer color out of the flora. I'd also recommend a hefty memory card and shooting in RAW format if you have access to Photoshop as you can tweak the image data as needed later on, and then convert them to whatever other format you need. As a side note, if you’re using a circular polarizer, and you’re switching the orientation of your camera from horizontal to vertical, remember you’ll have to rotate your polarizer 90° each time as well if you want to keep the current effect. On my last day I didn’t have any specific plans. I took all my gear with me in the car so I could either hike or paint as I saw fit. I actually anticipated that I’d be painting all day, but as I drove past the face of the Grand Teton I realized I was filled will far too much energy to stand still and decided to see how high up I could hike on a new trail and of course get hundreds of pictures along the way. I hiked further up than I ever have in m life, and was very happy with the view and the photos I came back with. Overall I was extremely satisfied with the trip as a whole. I was able to experience the landscape up close and personal, work on paintings in the field, and gather all the knowledge, reference, and experience that I'll need for years to come and in order to move forward in a clear and confident direction with my next series of paintings. I am very thankful to the Indiana Arts Commission and the state legislators for helping me realize this project. - extra battery & charger! I brought a Gore-Tex rain jacket with me in case I got caught out in a thunderstorm, which can happen very suddenly in that type of climate and can be very dangerous in regards to exposure and hypothermia. Thankfully I lucked out and the weather was really nice. Actually I shouldn’t say that I lucked out. I spent a lot of time researching the weather pattern histories for several prior years in order to pick a time that was late enough that there would hopefully not be too much of a chance of getting rained on the whole time, but early enough that it wouldn’t constantly be in the 80s or 90s and also that the little bit of snow that had collected over the winter wouldn’t have already melted away. I find that the pochade box is a great choice as opposed to a full-size french easel, as it’s much lighter, probably even if you consider that you’ll have to carry a tripod as well. But I also needed the tripod for any low-light photography. I think my pochade box is the smallest that Craftech makes, and like I mentioned earlier, that can be frustrating if you’re working on any canvas that isn’t small, because there’s not a lot of room to mix large amounts of paint. At least this was my experience. Your mileage may vary.